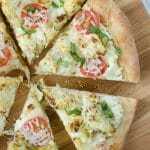 Roasted Garlic and Cauliflower Pizza – pizza with a roasted garlic ricotta sauce and topped with cauliflower, tomatoes, and fresh basil! Perfect meatless option for pizza night! Hi guys, I’m obsessed with cauliflower and I’ll talk about it more in an upcoming post because it’s, like, a thing in my life right now. Like, we ordered fried cauliflower at Megg’s the other day because I couldn’t resist. So naturally I had to put it on pizza. My oldest turned 11 this week and I’m not really sure how it happened. I made a small batch of cupcakes with this recipe and added sprinkles to the batter to make them funfetti-ish to celebrate on his actual birthday and then, of course, we did a real cake with gifts and all that over the weekend. 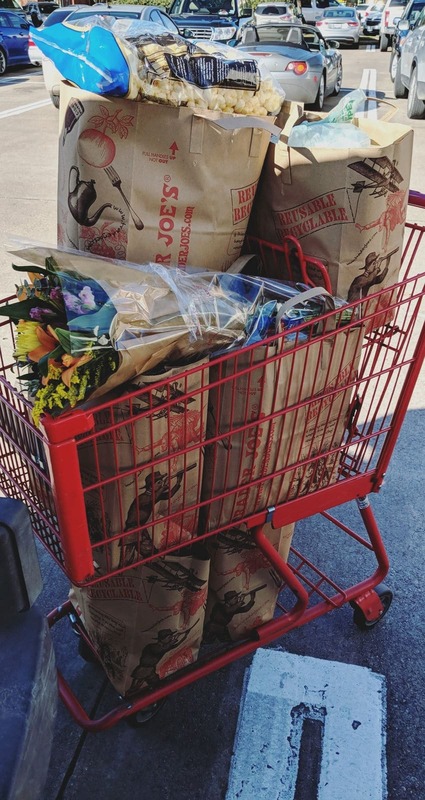 Finally made it down to Trader Joe’s. I haven’t been since before Christmas! 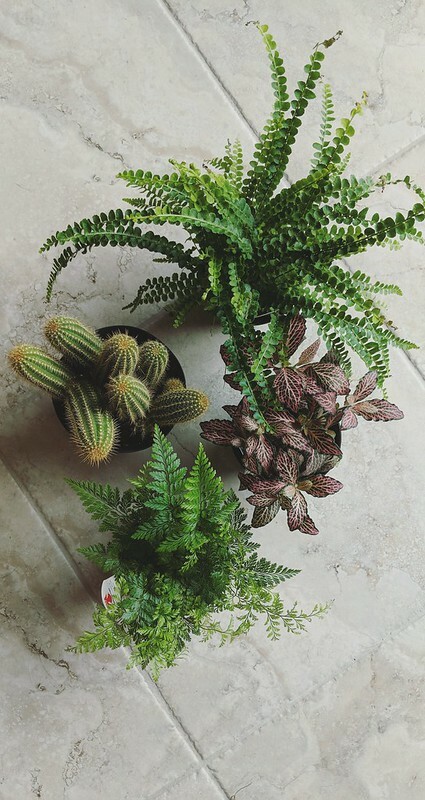 It’s only an hour away and every time I go, I tell myself that I’m going to find time to go once a month but then I never do and end up only going every 6 months and buying the entire store. I also stopped into Chi’Lantro while I was down there because it’s literally been in my Yelp bookmarks since we moved here (3 years ago!) 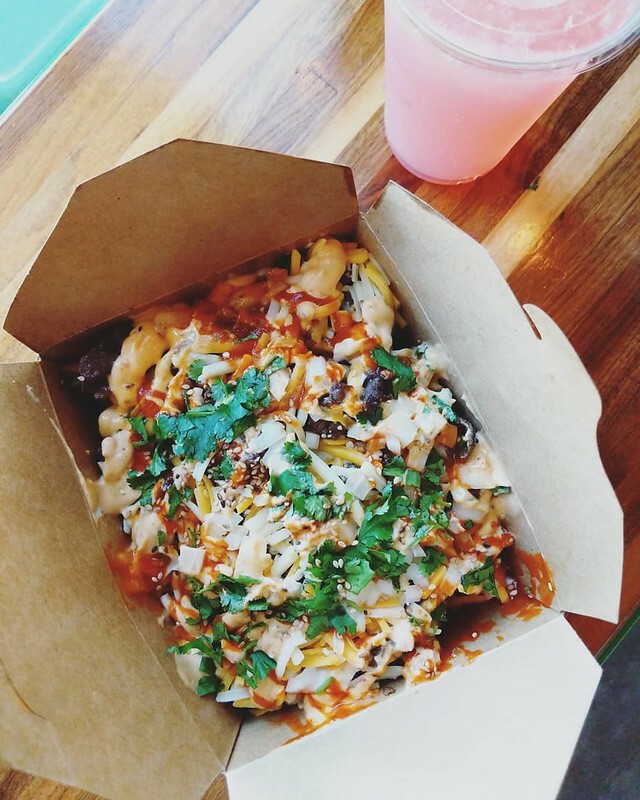 and they’re supposed to have killer kimchi fries. I still think Korean Kravings has the best ever kimchi fries but Chi’Lantro has strawberry lemonade. So. 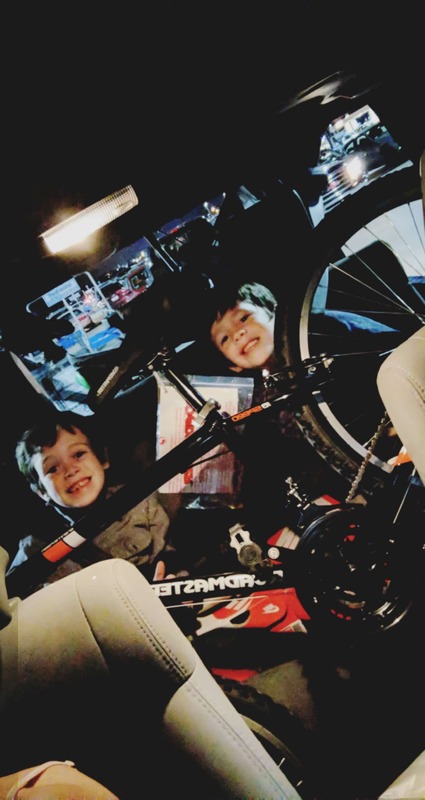 I’d promised the boys new bikes when we moved because I literally got rid of everything from our past lives so we spent our Friday night testing out new bikes and then trying to fit 3 bikes into my Jeep. The two little ones ended up with a bike practically in their laps. But now they’re bike riders at school which is so much more exciting than being a walker. In case you missed it, I posted the recipe for Pecan Oat Pancakes that tastes a lot like IHOP’s nut and grain pancakes or whatever they’re called and I’m obsessed witth them. I also updated my Homemade Shamrock Shake which is a must make for St. Patrick’s Day. Currently obsessed with Holy Kombucha’s Prickly Pear flavor, Survivor (I like Desiree, Wendell, and Dominick – which means none of them will win), and Snyder’s gluten free pretzels with peeled apart string cheese wrapped around it. 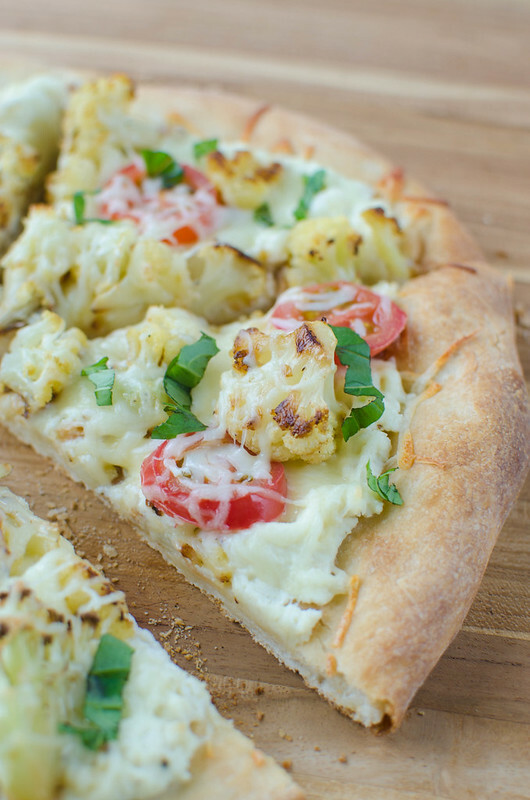 This is a really simple, meatless pizza – the garlic and the cauliflower are roasted on the same pan and you can totally do it ahead of time. That garlic gets mixed into some ricotta and that acts as your sauce. Top it with cauliflower and sliced tomato and cover the whole thing in cheese. And fresh basil on top because I’ve managed to keep my basil plant alive in this house so far. For, you know, about a week. Slice the top off the garlic bulb, exposing all of the cloves. Drizzle with 1 teaspoon olive oil and sprinkle with salt and pepper. Wrap in aluminum foil and place on a rimmed baking sheet. Toss cauliflower with 2 teaspoons olive oil and salt and pepper; transfer to the same baking sheet. Bake 20 - 25 minutes, or until cauliflower is golden brown and the garlic cloves and soft and pop out of the bulb when gently squeezed. Increase oven temperature to 450F. Place pizza stone in oven to preheat, if using. Stretch dough on a cornmeal dusted surface to desired size. Use a fork to make holes all over the bottom of the dough to prevent bubbling. Brush entire surface with 1 teaspoon olive oil. Bake in preheated oven for 8 - 10 minutes, until light golden brown. In a small mixing bowl, add ricotta cheese, desired amount of roasted garlic cloves (I used 3), and salt and pepper to taste. Stir to combine. Spread this mixture over the pizza. 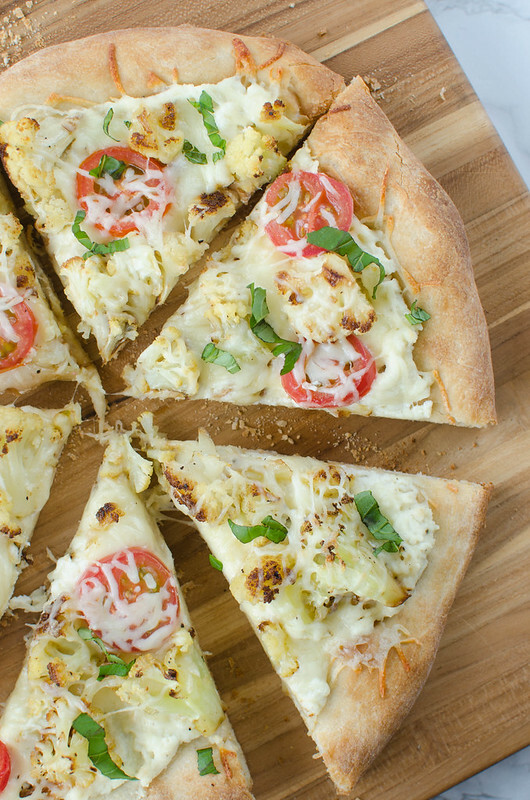 Top with roasted cauliflower and sliced tomato, leaving about an inch for the crust, Sprinkle with cheese. Bake another 6 - 7 minutes, or until cheese is melted and crushed is crisp and brown. Top with basil; slice and serve.